We start the second round of tastings with a few favorites, but also end up with some seriously lackluster sandwiches. Description and information is pulled directly from the Grandwich webpage. For more information and where to vote visit the official site. As we start our second day of tastings, our team of four is trying Grandwiches from the following establishments: Flat Landers, Birch Lodge, Terra, Stella’s, McFadden’s, Tavern on the Square, Peppino's Sports Grille and Sweet Melissa’s. Flat Lander’s features a pork belly sandwich with an apple and kale slaw and a sweet potato aioli. On our sandwich, the pork belly was extremely fatty and not rendered appropriately. We were hopeful for the sandwich because the ingredients sound delicious, but the execution of this sandwich just fell flat. With some more attention to the components of this sandwich, it has the potential to be a top contender. Birch Lodge served us a pulled pork sandwich on some sourdough Schnitz bread. It is topped with dill pickles, cherries, coleslaw and a corn/bean/pepper mix. It is a messy but surprisingly delicious sandwich. 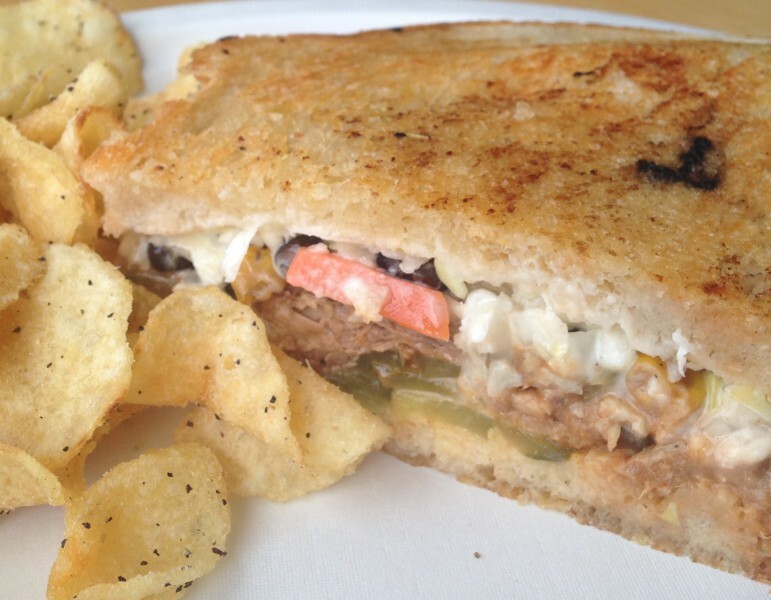 The flavors in the sandwich work well together, but still can be tasted individually. The side of salt and pepper chips is a great compliment to the dish. If you don’t like pickles, this sandwich might be better without as that flavor was really apparent to us. This sandwich was a favorite for three of us and second in our top three for the day. Terra GR’s offering this year is a pork sandwich with a cascade hops barbecue sauce, veggie slaw and a fresh pesto pasta salad. This sandwich is presented beautifully, but is overwhelming in its hops taste to the point it was almost inedible. One of our critics was excited for the fresh cooked pasta, but we all feel like the salad needs some kind of seasoning, as it was overwhelmingly bland. Stella’s was the frontrunner for the day. 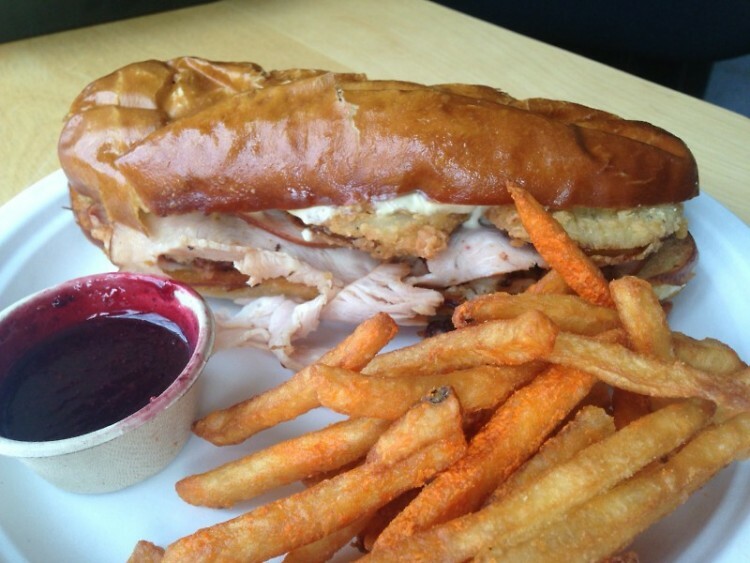 A roasted turkey sandwich with crispy pork belly and their "Famous Kream" sauce along with some delicious fried green tomatoes, berry sauce and a pretzel hoagie. The texture of the sandwich is successful, the flavors are rich and the ingredients are harmonious. This sandwich is a well-balanced, well composed meal choice. McFadden’s offering this year is a good attempt, but the sandwich needs tweaking. A meat heavy turkey sandwich with a minimal portion of coleslaw and chorizo sausage found us wishing the proportions or at least arrangement of the sandwich were different. When you could get a bite of everything, the flavors within the sandwich worked, but the way it is now, it’s just too unbalanced. Peppino’s offering this year is another meat heavy sandwich, the largest sandwich we’ve seen so far. But this one was another disappointment. The meat doesn’t have any exceptional flavor to it, and the distribution of tomato and onions made this sandwich poorly composed. The pale ale tomato sauce is lacking in any ale flavor and did nothing to elevate the flavor of the sandwich. Sweet Melissa’s rounds up our top three of the day with roast beef, ham, salami and prosciutto. This sandwich is topped with kale and a tomato basil aioli, creating a delicious take on a classic sandwich. 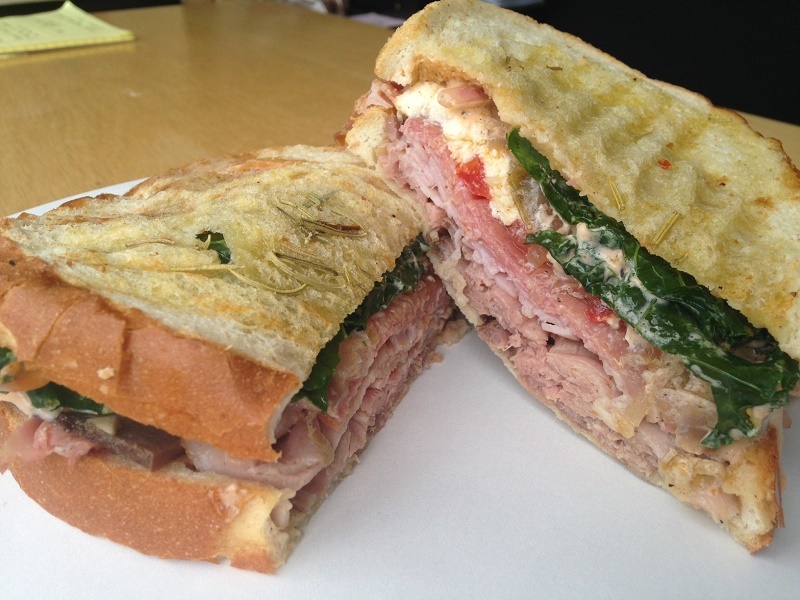 We couldn’t find much mozzarella on our sandwich, but the rosemary on the sandwich as well as the high quality meats used really helped elevate the flavors in the sandwich. This sandwich has the kind of flavor profile that will appeal to a wide variety of people. Let us know in the comments what you've tried, or hashtag #RapidianEats on Instagram or Facebook with shots of your own Grandwich experiences.